Ground staff on the Wits Braamfontein campus allege that they are not provided with gloves while working with organic waste. Newly-insourced ground staff have alleged that they are facing health and safety risks due to Wits management’s decision to remove concrete dustbins across the various campuses. Wits ground staff working with organic waste alleged that they are not provided with standard protective gear. 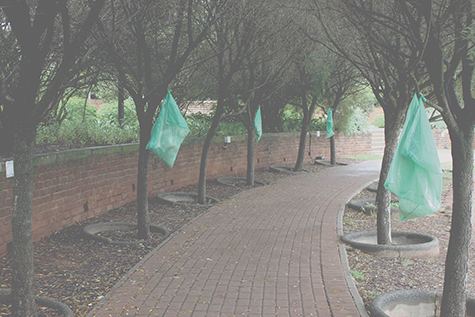 The ground staff who work on the Braamfontein campus, have expressed concern at the use of plastic dustbin bags as a replacement for the concrete dustbins which were destroyed during last year’s student protests. According to a staff member who wishes to remain anonymous for fear of victimisation, paramount of these concerns is the health risk posed by the lack of protective gear for workers who manage the organic waste removal process. 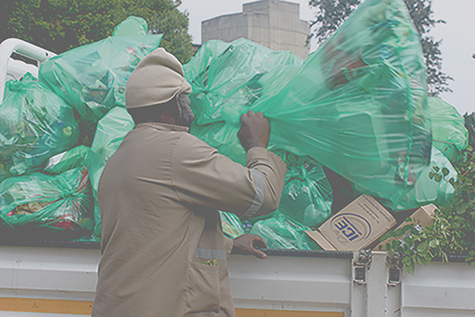 The provision of gloves for waste collection is outlined as a minimum requirement within the Gauteng Waste Collection Standards and, according to the worker, “it is too important to work with gloves because safety comes first and a glove is part and parcel with safety”. The staff member told Wits Vuvuzela that, despite staff having addressed this issue in a letter to the Property Management and Infrastructure Division (PIMD), gloves had still not been provided since the insourcing process and there had been no communication regarding whether new dustbins would be provided. PIMD director Mxolisi Dube, however, said staff had been issued with protective gear as per the provincial collection standards. Plastic dustbin bags have replaced concrete bins throughout Wits Braamfontein campus. Despite a statement by Dube saying that the 92 ground staff members are given “approximately 200 bags daily for litter and garden refuse”, staff told Wits Vuvuzela that the number of bags they receive daily varies, and that the bags are not durable. Ground staff member Thabang Mofokeng echoes these grievances stating that each staff member is only provided with 10 bags daily, with no guidance from management on where to place the bags, and that the bags provided often tear open during collection. According to Dube, “the concrete dust bins were removed due to student vandalism during the Fees Must Fall Protests”, however, “this is a temporary solution whilst awaiting delivery of the new bins and is the most practicable and cost effective interim solution operationally…New steel bins have been placed on order, delivery is awaited”. Glen McCall, member at Enviro Elements, the university’s previous dustbins supplier, estimated the cost of a single steel bin at R2500 to R3000.